But to Doug, planting some noncommercial crops seemed an antiquated practice, like using a horse-drawn plow. Cover crops had long been replaced by fertilizers. Still, he shared his brother’s concern about their soil. Its texture was different, not as loamy as it had once been, and a lot of it was running off into ditches and other waterways when it rained. So in 2010 the family decided to humor Mark by sowing some 1,200 acres, which Mark describes as highly eroded farmland, with wheat cleanings and cereal rye. Additionally, they spread some cover crops to eroded areas in a few fields. 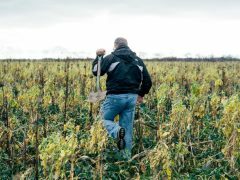 Now some 13,000 of the 20,000 acres that the family farms across nine counties are planted with cover crops after harvesting, and farmers around them are beginning to embrace the practice."